﻿Learning to kayak can seem overwhelming to a beginner. The wind comes up out of nowhere. The boat is hard to control in waves. Sometimes you get even wet! It’s a good idea to take a course, but what should be covered in a good basic course? Based on 20 years experience teaching sea kayaking I can say simply that the over-riding goal of paddling courses should be to teach the philosophy of safety. Look for a course with some discussion of the objective risks of paddling in your area, and ways to reduce those risks. Expect to hear some rules, such as “never paddle alone”, but look also for some ideas on how to think for yourself and what to watch for. You can’t learn everything about equipment in a day or weekend course. Worry about the intricacies of hull design later—look for some practical instruction such as how to fit the foot-pegs and backrest so you will be comfortable in the boat. If you’re not comfortable, you won’t have as much fun, and if it isn’t fun, why do it? Another main topic related to the kayak is buoyancy. The combination of bulkheads and hatches provides the kayak with flotation in the event of a capsize. If your kayak sinks, none of the rescues you learn will work! So learn how to check your bulkheads and to seal the hatches properly. Another topic that is essential here is how to carry the kayak without toasting your back—especially when it’s loaded. You also learn the basics of sizing and using the spraydeck, lifejacket and paddle. Some courses tend to focus mainly on paddling strokes, and teach you just enough to make you really dangerous. All you need here is the basics of paddling forward and backwards, stopping, turning with sweep strokes, low bracing, and maybe the draw stroke. This last skill is particularly useful when someone capsizes about five feet away, right beside you! There are many ways to come to the aid of other paddlers who have capsized. But the bottom line is that you ought to learn to get back into your own boat, in case you capsize while trying to rescue someone else! My personal favourite is the paddle float rescue. Not because I think it would work in all conditions, but because I think it is the most likely to work. If you can get your body out of the water and into the boat with a paddle outrigger attached, your chances of surviving hypo­thermia would improve drastically. Learning to rescue other paddlers is also critical. I prefer the rescues involving getting someone back in their boat, then pumping the water out (‘pumping rescues’), rather than rescues where the super-hero lifts the bow or stern, emptying the water out (‘dumping rescues’) while the victim patiently waits in the saltchuck. To me, the bottom line with rescues is, you really don’t want to have to use them. That said, the reality is, when you go to sea in a small boat, you run the chance of tipping over, so you must be prepared for for this eventuality. Learn rescues, and practice often. How do you tell when it is safe to go paddling, and when it is not? You must have some understanding of the conditions you are likely to encounter. Look for some explanation of how the sea works in your area. There are a lot of factors, depending on where you live. Here in British Columbia, I cover these topics: tides, currents, weather, wind, waves, traffic, fog, night, and the difference between paddling on protected waters versus the open coast. Remember, you’re looking for pragmatic information here—you don’t need to become an oceanographer to have fun paddling! There is a wealth of navigational information out there nowadays, and some pretty sophisticated tools. This is an area that you will need to work on, to develop your skills and experience over time. Look for some instruction in use of the basic tools, namely a nautical chart (map), tide tables, and marine weather reports. 99% of paddling can be done using only the tools listed above, and I want people to realise that, and develop basic proficiency, before I scare them off with a compass. Definitely look for some instruction in using the compass on a longer or intermediate course (it’s actually quite simple, and involves only arithmetic, no math). Don’t leave shore in fog until then! When you do start to explore new areas, you need to be able to figure out where you are on the chart at all times. It’s not like the mall—there is no arrow pointing “You Are Here”. This skill is called “piloting”. It’s a combination of map-reading and observation. You need to learn to estimate how fast you are paddling, how fast you are moving (these can be different when paddling in tidal currents), how far away things are, and which island is which. This can be taught on a course while you’re out paddling around. If it’s not included in the curriculum, sidle up to the instructor and ask questions. Finally, group dynamics is an important, often over-looked topic. Learning how to make consensus decisions is critical-if someone does not want to go, better to find out before you leave the beach. It’s easier to prevent problems in advance than to fix them later. We need to create a supportive atmosphere where the person who is nervous feels safe to disclose their fears. A final note: watch out for the “sea kayaking course” that is a guided tour in disguise. Guided tours are fun and can be a good introduction to paddling, but when choosing a course, look for one with a goal and measurable objectives. You can then choose the course that meets your needs, and afterwards, determine whether or not you’ve accomplished your goal. 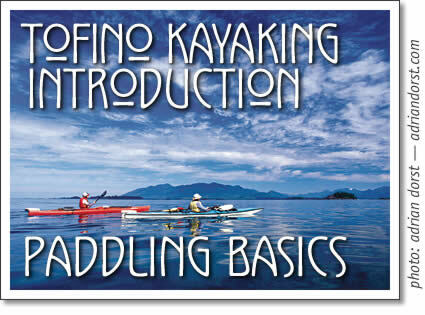 Tofino kayaking introduction: Paddling Basics - written by Dan Lewis for Tofino Time Magazine.